Ian Burnett – The Highland Chocolatier Aberfeldy, Perthshire, Scotland. I’ve stayed away from chocolate for years terrified it would disrupt my sleep no matter how early I ate it in the day. One small bite would be enough to keep me up all night so anytime someone suggested we stop for some chocolate, I’d cringe. This time while driving through Aberfeldy in Perthshire, I came across a charming little shop that was absolutely irresistable … a chocolate lover’s dream destination … a velvet truffle that is a silky smooth bite of heaven; a passion fruit mango truffle a true taste of the tropics, an exotic lemongrass velvet praline and a spicy raspberry pepper truffle … sleeping is for the birds! There’s never a bad moment for Japanese, especially good Japanese. Subdued wood paneling wraps the elegant space where soft music is played, giving this dining hall a very zen feel. A friendly server and a rather genuine menu of sushi and specialties like the seafood bowl served in a stone hot bowl with vegetables and a quail egg. The panfried vegetable Gyoza was delicate and flavorful and the main course servings were bountiful . Each melt in your mouth miso glazed black cod entrée was served with tempura of shrimp and vegetavles, white rice, salad, pickled ginger and porkbelly. The black sesame ice-cream was nutty with the perfect degree of sweetness as was the green tea moshi that came with it. Delicate and delicious Japanese. As simple as that, just the house number. No fancy names or big signs here. Just another understated bar in Catalunya but don’t be fooled by its simple outdoor esplanade, it may look like any other neighborhood bar in Spain, but its menu is a really nice box full of suprises. Starting with the cruixent with foie gras and apple sauce, silky duck foie wrapped in crunchy phyllo served with baked apples, apple sauce and a drizzle of balsamic vinegar. The croquetas were a hearty homemade bite of delicious bechamel and roast beef and the tender apple tart with vanilla ice cream was a real treat. Who would’ve known El 19 had such an exquisite menu. Luckily, now we do! There’s nothing like walking into a modest neighborhood bar to be then pleasantly surprised by superb homemade cooking. That’s exactly what happened when I stumbled upon Florido bar in Marbella, Spain. Most Spanish bars tapas are great but the ones I found here , no doubt, were some of the best I’ve ever had. When in Spain, I can’t go without my daily “ración de tortilla”. No matter the town, I have to have a small portion of egg, potato and onion omelet. But not all tortillas are created equal and making the right “tortilla” is a fine art. The key is to balance the ratio of eggs to the potatoes and onions, and, of course, to season it well. Often times, tortillas are served on the starchy side because too much potato has been added resulting in a dry omelet, and when made with too much egg, it can become a runny mess. So when you taste one made just right, tender and juicy, it’s like tasting heaven on a plate. Florido’s tortilla is a true masterpiece! Also on the menu are tapas of Spanish meatballs and veal cheeks with fried potatoes, among many other great selections, that can be nicely finished off with Florido’s other homemade wonder: the flan, a creamy and light caramel custard topped with freshly whipped cream. 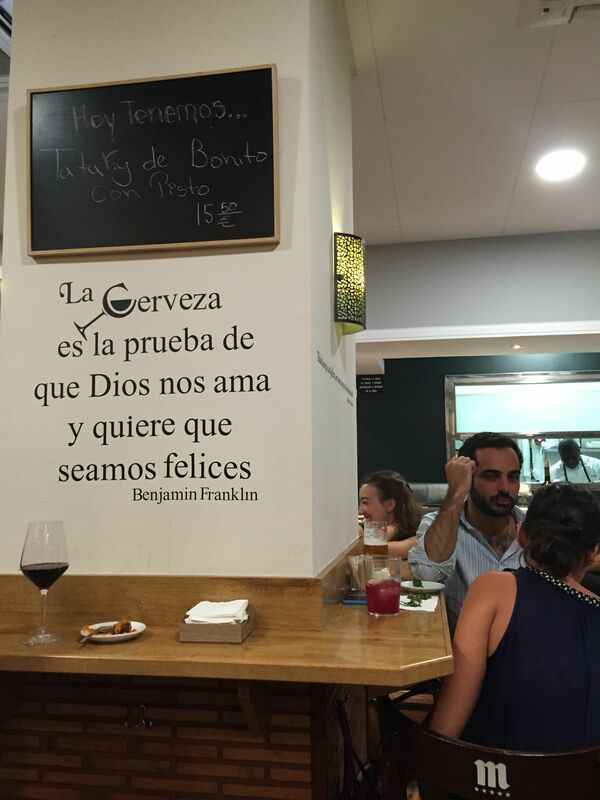 So next time you walk by a simple neighborhood bar in Spain, stop in. You might just find a culinary treasure trove hiding inside. If you’re looking for real Italian, this is it. You cannot get any better than the homemade cuisine served at this cozy eatery located in the heart of Marbella’s old town. 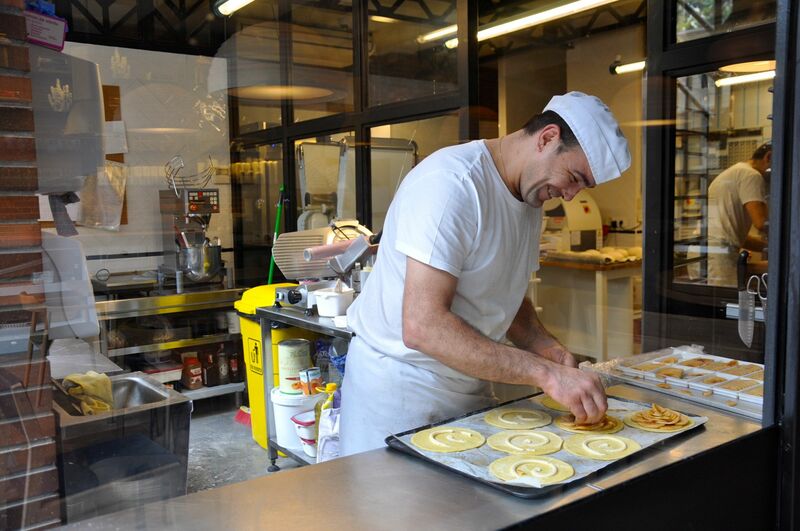 Stuzzikini offers a unique menu comprising of mainly Sardinian dishes with some interesting Piedmontese favorites like the raviolini del plin – a beef ragout ravioli served in a delicate beef reduction made with butter, sage and aged Parmesan. The bucatini carbonara here is the real deal, no cream, just fresh eggs and a generous touch of pork cheek bits that give it a slight saltiness and crunch – divine! Appetizers like the Fregula Sarda – clams and mussels with minute pasta balls in a saffron garlic and white wine reduction or another Piedmontese favorite -vitello tonnato – thin veal slices smothered in a tuna and mayo sauce were absolute pleasers. 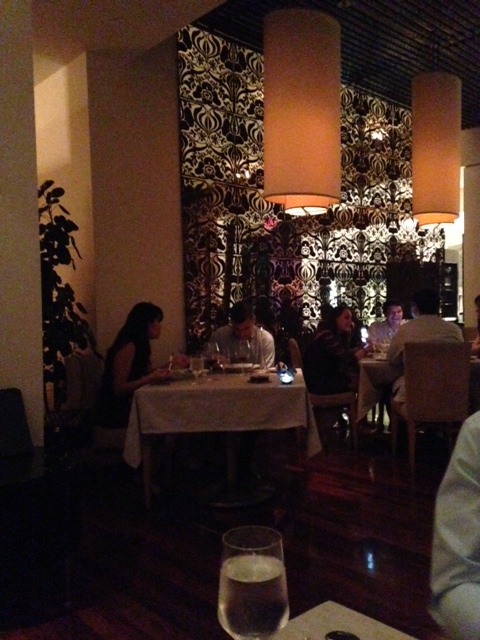 Aside from a great wine list, the desert options were varied and light. Just like everything else on the menu, the final touches to our meal were all homemade: from the rich yet light tiramisu, the creamy ginger panna cotta with citrus coulis to the tiny cream filled profiteroles covered in melted chocolate. 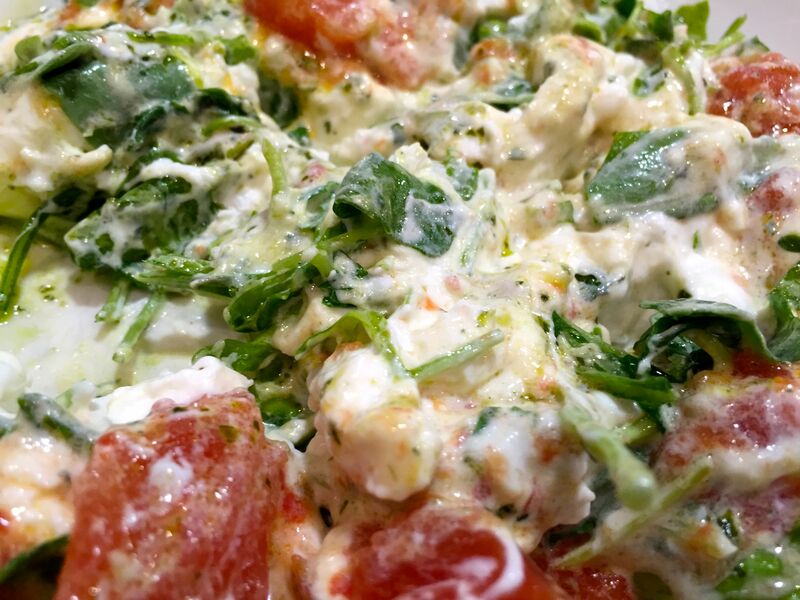 If you want to be in for a true Italian treat, Stuzzikini is it! Tapas are what you want when in Madrid. No need to book a table at a fancy restaurant -there are plenty of great ones – but really, tapas are satisfying enough and often times much more fun. It’s all about sharing small portions of whatever the bar serves and most offer great dishes that pair really well with a cold “caña” (small glass of draft beer) or a nice “chato de vino”, a small glass of wine. On a warm tueday night last august, half of Madrid had gone on vacation. Many restaurants and bars were closed . 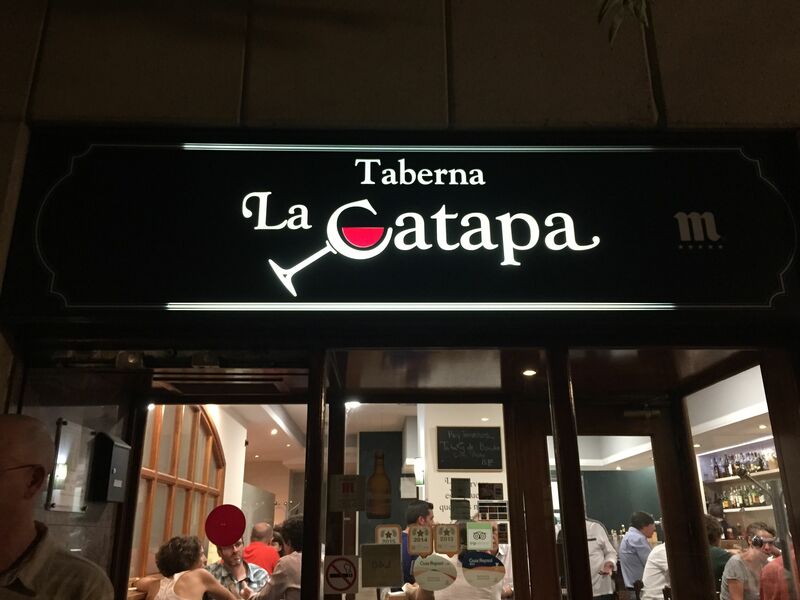 Fortunately, in the barrio de Ibiza, near the Retiro park and Salamanca, a few were still open like La Catapa on an otherwise boring weeknight. Packed with patrons, as if no one had to work the next day, this small eatery was bustling with people while a petite waitress ran around tables ensuring everyone was well served, the chef also comes out to check on his happy crowd. Another fun spot for tapas and drinks in Madrid. 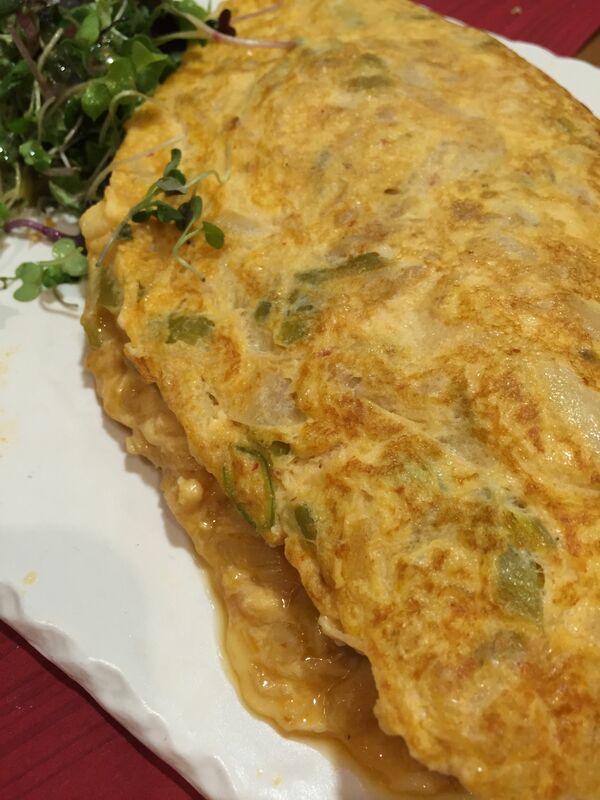 We ordered the tortilla de bacalao…a freshly made omelet oozing with sauteed salted cod, onions and green peppers served with plenty of country bread…a lovely combination that proved absolutely satisfying. We also had a nice salad of burrata drizzled with a basil vinagrette that was nicely chopped up for tapa convenience – when sharing you want to have bite size pieces on your plate for easy serving. I thank God for places like this one that make a tuesday night a little more special, breaking away from the sleepy routine of a hot summer weeknight in Madrid. 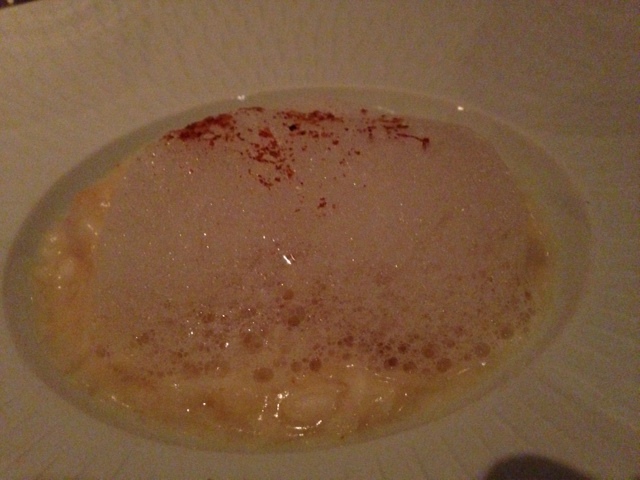 Ticety – A French treat in Coral Gables, Florida. After an extensive renovation in 2013, Azul has re-emerged as a sophisticated and undeniably interesting restaurant that serves an innovative fusion of French and Asian cuisine. With Executive chef William R. Crandall at the helm, eating at Azul has become a truly exciting experience, leaving any of the old hype about pretentious hotel restaurants behind. When I first visited Azul back in 2004, the only memory I took with me was that of a great cocktail and an astronomical bill. I honestly cannot remember what I ate, and I can assure you, I only had one drink. The meal just wasn’t anything to write home about. This time the experience was rather different. Not just because I opted for the Miami Spice menu for $39, offered every year in August and September to promote local restaurants, but because what I ate was truly delicious and different. And I honestly wouldn’t mind paying more! I often stay away from special menus because I don’t like to be told what to eat….got enough of that while growing up. But, I was pleasantly surprised by the great options on this particular one with beginners such as vichyssoise, steak tartare and tomato salad. A great variety of entrees like salmon, risotto or pork belly were very tempting and so were desserts like the passion fruit crème brûlée, the Meyer lemon sable and the chocolate pecan financier. On this balmy September night, the vichyssoise was in order. 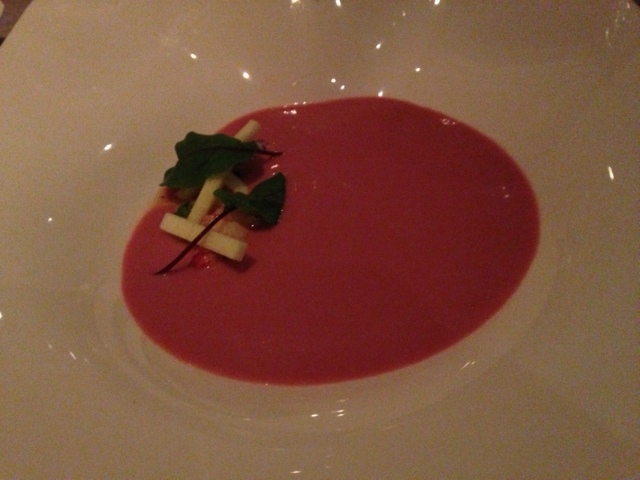 This one, was made with beetroot dotted with bits of lobster meat, a creative touch that added a salty contrast to the sweet creamy chilled soup garnished with thin tangy green apple sticks. For the main course, I opted for the celeriac and pink shrimp risotto made with tiny bits of diced celeriac that gave it a nice bite. Velvety and light, a perfect alternative to the sometimes heavy arborio rice! This time, I must say that dessert was welcome. 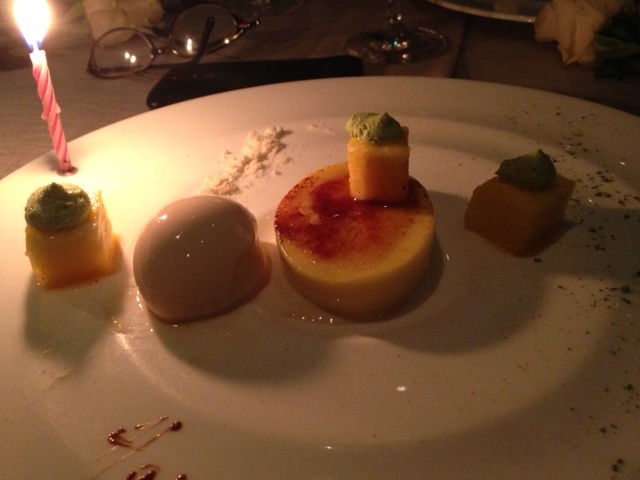 I don’t usually order any but who could turn down a passion fruit creme brûlée garnished with white chocolate sorbet and fresh chunks of pineapple? An ever so light custard combined with just the right amount of creamy sorbet to take you to heaven for a moment. Maybe, that’s why it’s called Azul – blue – like the sky, because you could say that the food has been elevated to new heights. What can I say? I really enjoyed this meal and can’t wait to go back! What a concept! A boutique hotel with its own bakery! What else do you need? Absosulety nothing. 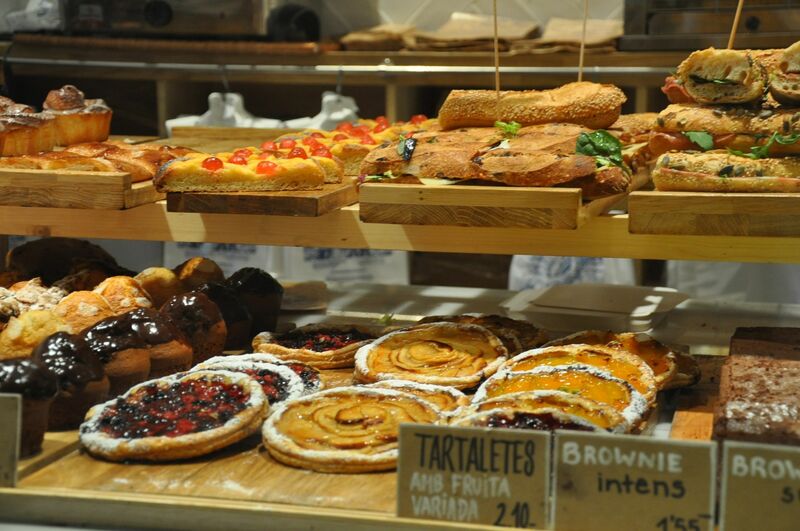 Every morning, the smell of freshly baked goods will entice you to have a delicious breakfast of warm bread and flaky pastries that are an absolutely delightful sample of Catalonian baked goodness. You can choose from an endless variety of breads that go from wholewheat baguettes, spelt rolls to rustic loaves made with black olives. As far as the pastries go, thin apple and berry tarts, cupcakes and the ever so delightful ensaimadas, a light and airy Danish of sorts will make your mouth water. I had the ensaimada de cabello de ángel, light and fluffy dough filled with threaded pumpkin jam, exquisite! I had my breakfast with a cup of truly *”relaxing” café con leche and a glass of freshly squeezed orange juice. A delightful meal that would get me ready for another day of exploring enchanting Barcelona. A good night’s sleep and an even better breakfast, what else do I need? 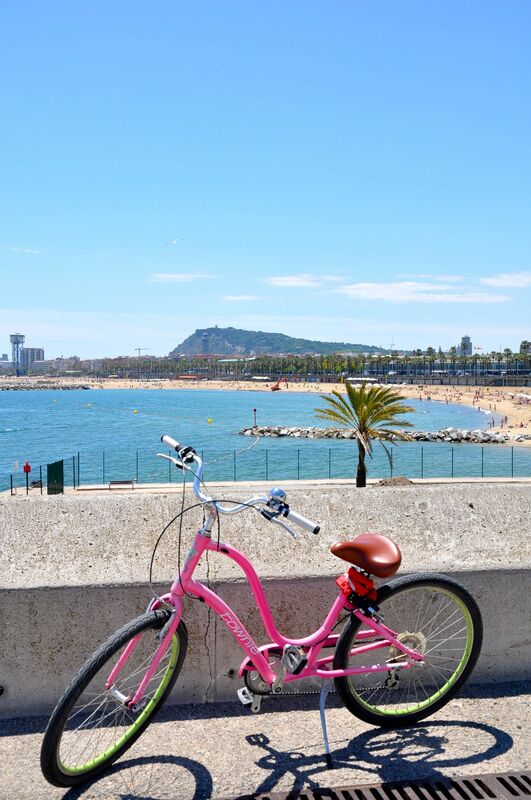 Oh, yes, my bike to burn off all those calories! 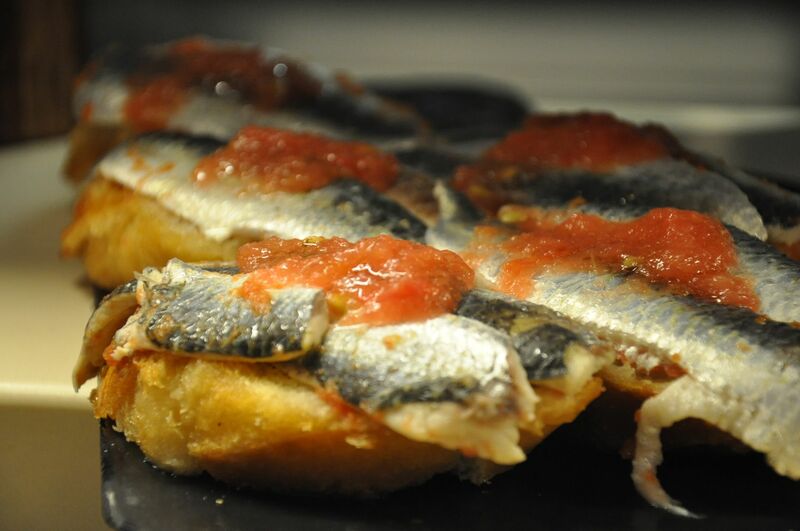 A Basque word for tapas, the pintxo is everywhere to be found in stunning San Sebastian. 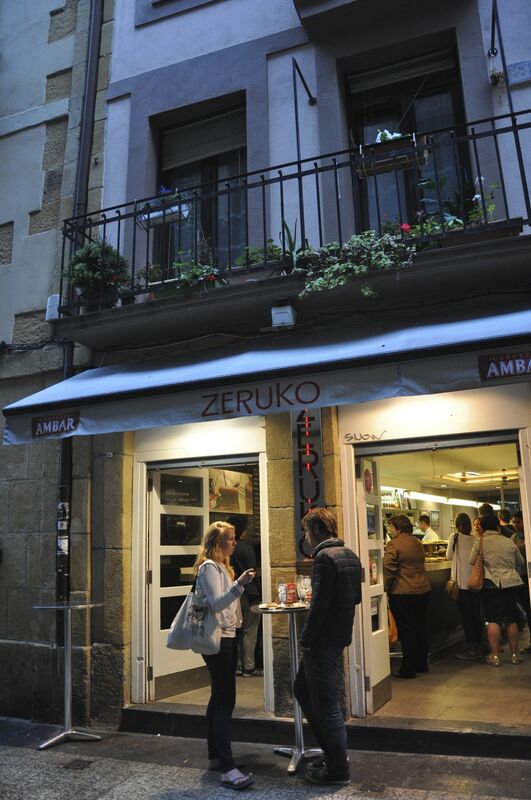 I was fortunate enough to stumble upon Zeruko on calle Pesqueria in the old part of town. A rather hip spot that offers a generous variety of fresh samplings of some of the best in Basque cuisine. Order a glass of wine or beer and delight yourself with exquisite bites of fresh fish, seafood and meat that are hard to resist. 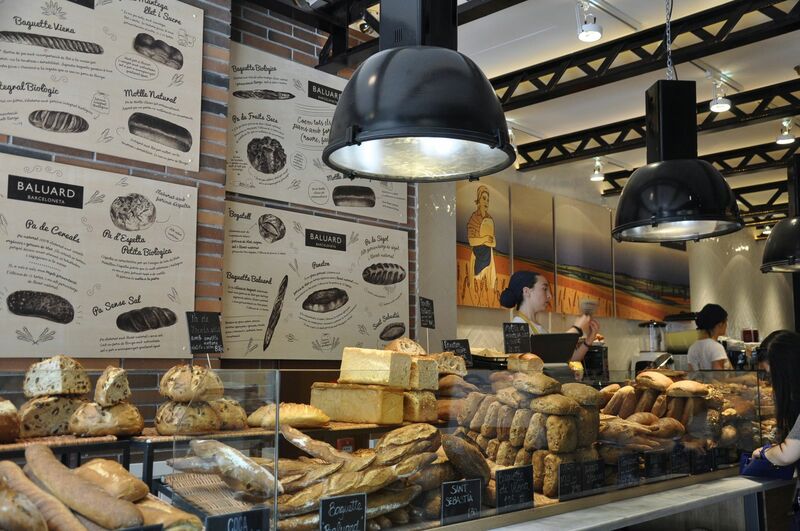 Slices of Spanish bread gingerly topped with different delicacies spread across the busy counter,waiting to be snatched by hungry patrons who have a hard time deciding what to choose first. A rather fun way to eat! 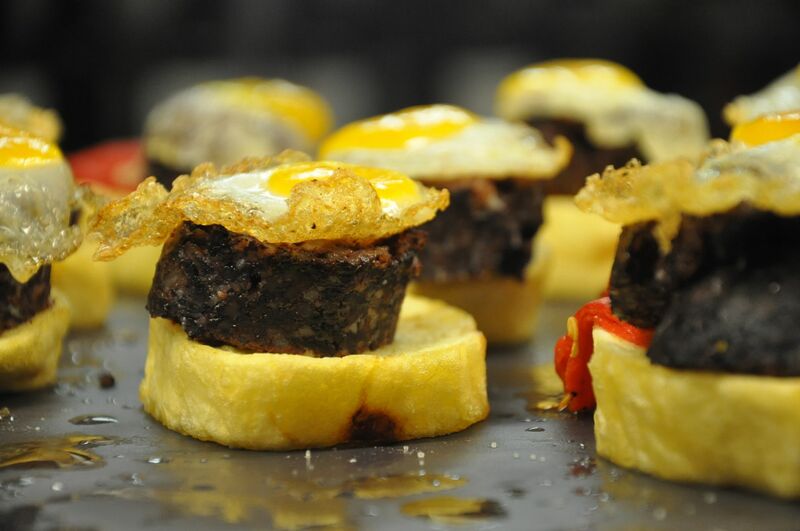 I couldn’t resist the pintxo de morcilla de arroz con huevo de codorniz, a slice of grilled rice filled blood pudding topped with a tiny fried quail egg, rich to say the least but absolutely delightful! The pintxo de sardina con gelatina agridulce de cítricos was a tangy tasteful bite of fresh sardine topped with a dollop of citric sweet and sour gelatin. Quite an unusual yet delicious combination! 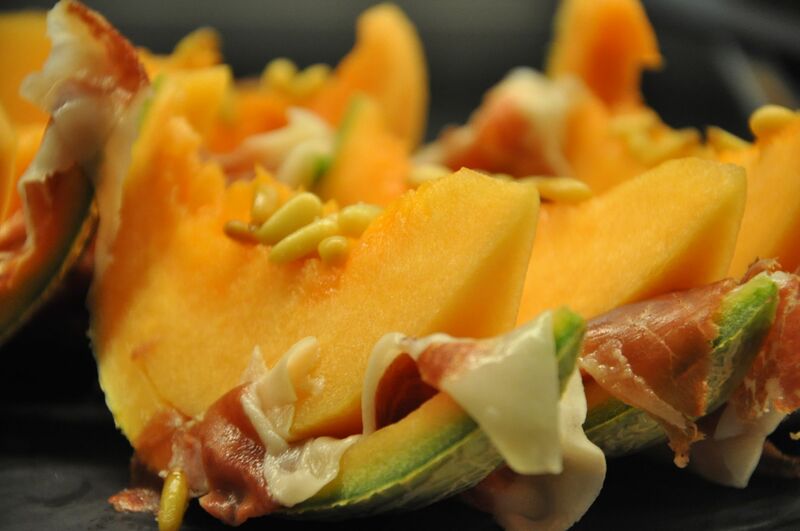 A more traditional one was the pintxo de melón con jamón , melon with Iberian ham topped with pine nuts ingeniously meant to resemble the fruit’s seeds. Overall, Zeruko is a fabulous fusion of contemporary creativity and old fashioned favorites!